I have been sitting with the idea of merging my (new) personal body positive blog onto Radical She Tarot. I recently started this personal blog to share my daily life, books I'm reading, and everything body positive related but thought I should keep the two separate. Then, the other day I wanted to begin writing a post about the lack of body diversity in tarot and was stumped as to where I should share this post - on my body positive blog or tarot blog. The subject related to both so that is when I started thinking about the merge! Since tarot has been a major tool in my own radical body love journey, it only makes sense to move it to the Radical She blog, am I right?! TRIGGER WARNING (weight loss): This body love journey I am on right now has taken a center focus in my life, a much needed one. I've struggled for years with loving myself and the body I'm in - and I'm at a point in my life where I'm sick and tired of this game. My body is tired of it as well, I'm sure. I have put my body through hell over the years! Between 2015 and 2016, I lost 100 pounds in 11 months and from 2016 to the present I have been up and down with some of that weight. I've gone from a binge eater to restrictive eater and back to an extreme binge eater. I'm trying to heal my relationship with food through intuitive eating and HAES (Health at Every Size). I recently threw away my scale and vowed to begin a relationship with my body landscape rather than try to mold it into another. In case you haven't seen me in person (99% of you haven't) I'm not a thin or skinny girl, lol! I'm a plus size chick who uses the word "fat" because that is what I am and that is a word I prefer to use. I've been using tarot as a tool to help me on this journey and it's been extremely helpful! There are some spreads I have created to help me and I would love to share more of this soon. Many readers have a favorite topic to read tarot for, some like reading about finances or love, mine has always been in the topic of self love. They're my favorite type of reading to do, along with personal empowerment and self discovery. 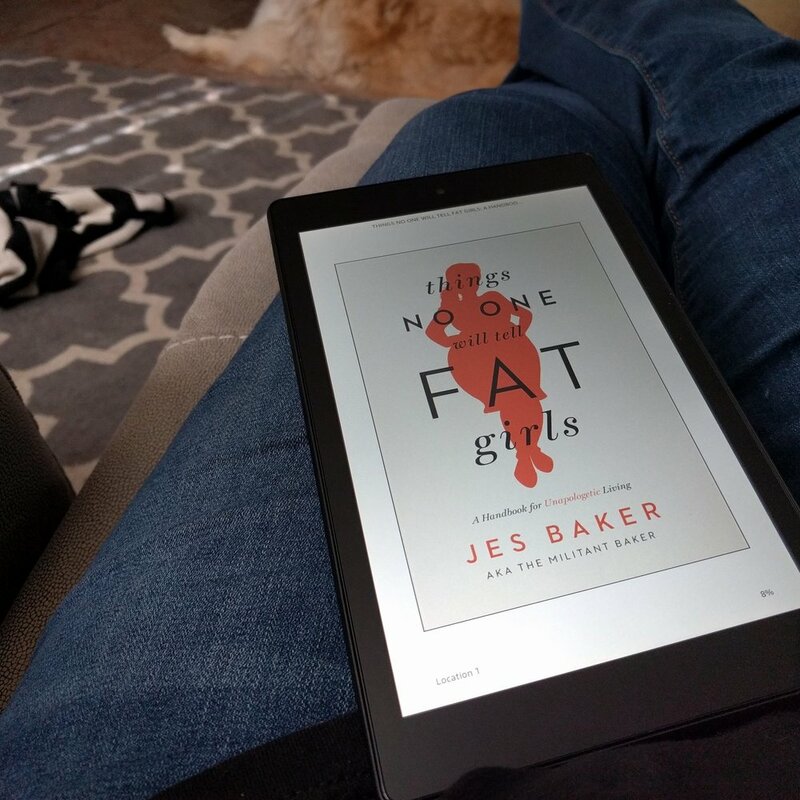 Things No One Will Tell Fat Girls by Jes Baker - fantastic book! So what will be coming to the blog? A lot more personal content! I plan to share my daily life (not every day, but at least once or twice a week), books I'm reading, things I'm loving, tarot and body image, and more. I just got a Kindle as a super early B-Day gift two weeks ago (I'll be 35 on June 21) and I'm obsessed! I'm reading all my books now on Kindle and have been filling my queue with body positive and fat positive books. I've also recently joined The Body Positive Book Club on FB hosted by Michelle Elman - love it!! I've finished 3 books since getting the Kindle, all have been a big inspiration on my body love journey right now! I want to share the books and people who have been inspiring me very soon. On thing to note, reader interviews will be on a break for a bit. I have one last interview that will be posted next week but then no more for a while. It will be back though, I just need a break on those for a bit, sorry guys! If there is anything on the blog that you would like to see that is tarot or body positive related, please let me know in the comments! Ok, I've went on enough! I'm excited to open up more on the blog and take you all along with me on this radical journey, I hope you guys love what I'll be bringing to the blog and stick around.